Extended writing is becoming more important at GCSE where the new specifications are demanding students to think at a higher level and to structure their written answers. As a result, I have been trying some techniques with my current Year 10 students that I hope to integrate into our new GCSE schemes of work. 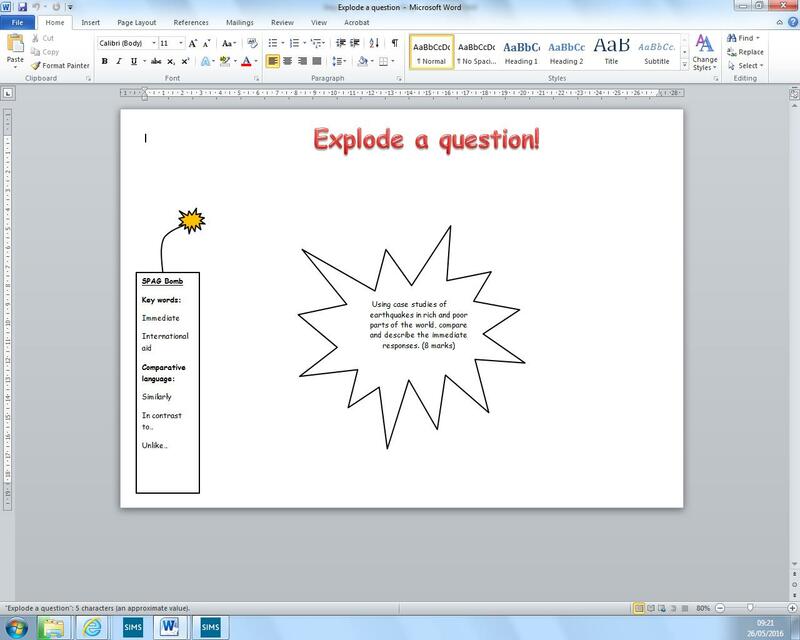 My first idea is taken from @MrThorntonTeach and his brilliant idea of ‘exploding’ an exam question. Examiners’ reports always include a comment about how students should focus on ‘deconstructing’ the questions so that they can achieve higher marks, and ‘exploding’ sounds much more exciting to Year 10 than ‘deconstructing’. Students are encouraged to pick apart the question by focusing on the command word initially and then the key terms. Following this, they use their exercise books to plan an answer and, in particular, include key statistics that are often forgotten. This planning exercise has encouraged my students to write more focused and detailed answers. The game of consequences can also be adapted to writing exam answers, as it persuades students to write more and explain further. If using the PEE method, students write a point on their paper before passing to another student who writes the evidence, and then again to another who writes the explanation. Using timers or music creates an atmosphere of playing a game, when in fact they are completing an extended writing task! This task has helped my students to focus on the structure of their writing and is a useful form of peer assessment. Similar to the game of consequences, my Year 10 students got really animated about the added excitement of scrunching up the paper and throwing it to another student. Clear guidelines do need to be in place so that no one gets paper thrown at their face, but the students were very enthusiastic. I set an exam question and they wrote the first sentence in a timed period of 2 minutes. They then scrunched up the paper and threw it to another student who wrote the next sentence. By the end of the process, they were all checking each other’s work and correcting any mistakes or improving. This helped them to realise the importance of proof reading and going back to the question so that their answer was clear. My final idea is one that I picked up at a GA conference. Students always struggle with writing a full explanation and the Geography ‘parrot’ can be a useful tool to help improve this. When setting an extended writing task, have a picture of a parrot (or a toy one) on display. I often circulate round the room and read their work before asking them “why, why, why?” so that they can see that their explanation needs extending. Once the students become more aware, they can also read each other’s work and write “why?” next to statements that need expanding. Seeing the image of the parrot reminds students to focus on their explanations and hopefully improve them! I hope that these ideas are useful when planning the new GCSE schemes of work and that your students can become as enthusiastic about extended writing!